Burger Bedlam is pleased to team up with our most recently reviewed best burgers in NYC competitor, Jo's. With a fantastic brunch menu and solid burger, we're hoping everyone takes advantage of this deal! Jo's: Mention Burger Bedlam when ordering the Burger Deluxe and get the burger and a beer of your choice from any of these three craft beers - Victory Prima, Abita Amber, or Wolaver's Pumpkin Ale (our pick for fall!) for $14 (regularly $17). *Promotion runs through October 31, 2010* DEAL HAS EXPIRED. Check back often to our burger coupons page for the latest deals and contact us with any comments (good or bad), ideas or suggestions you may have for us! Also don't forget to follow us on Twitter and friend us on Facebook for all the latest Burger Bedlam news. From time to time along our search for the best burger in NYC, we visit what’s commonly known as “foodie establishments” in Manhattan. Evidently, most of the eateries on our “to be reviewed” list are typecast as such – and we’re not complaining. So, recently we had the opportunity to hit up one such restaurant in the form of Blue Ribbon Bakery on Downing Street in the West Village. Not to be confused with Blue Ribbon Brasserie over on Sullivan Street but bearing the same owner and family of restaurants, the Bakery serves up a healthy portion of beef that’s often on many critics’ short lists of best burgers in NYC. In doing so, they have taken an item which is plainly described on their “all over the place” menu, and made it into a must try, even after you scarf down the fresh breads they serve with your meal. Even better, doing so in an unassuming brick-walled village locale makes you feel at home as you dine – making that such an, ahem, treat. Our Expectations: The Hamburger Deluxe. Served up with lettuce, tomato and raw onion on a house-made sesame seed topped bun. A grill marked and approximately eight-ounce patty which has been grass-fed and locally raised is what we’ve read, so a flavorful and fresh bite should be instantly recognizable. With a rich history of award-winning fare, Blue Ribbon shouldn’t fail to impress. Just ask Martha Stewart if she likes it…Yes, that was a Martha Stewart reference, your eyes aren’t deceiving you. Meat: Scrumptious is a word that comes to mind, as the Blue Ribbon eight-ounce robust patty is tasty and savory all in one bite. Nicely seasoned and delicately grilled, the meat looks tasty pre-bite and continues its sensory enjoyment on your palate. Though, despite the victory in taste, the freshness check is the patty’s downfall, as the meat does taste less fresh than it should. Negative points in that regard. Still, the cooking temperature was on par with our Medium Rare request, which makes us happy. Toppings: Basic toppings and nothing out of the ordinary, but if we’re gonna be sticklers – and we are – the cheese is sloppily topped on the patty, with a less-than-melted consistency. The more you melt the cheese, the better the gooey goodness comes, so we weren’t fully pleased. Still, the raw onion is a good call as every bite deserved the crunch and sweetness to counteract the savory that is the patty. Bun: A disappointment, the bun was slightly oversized and gave us more than we could handle in terms of bun to meat ratio. Additionally, although we enjoyed the breads provided in the table’s basket, the bun wasn’t necessarily above average, despite coming from a bakery. We expected more. A nice fluffy custom-baked bun, yes, but lacking much of the sweetness and complementary taste we’ve come to expect from most buns. Meat (44): A pleasantly seasoned patty with above average taste and coming in at a relatively larger size. Still, it lacked in the freshness department and was less juicy than we desire. Toppings (19): Standard stuff and a bit amateurish in the melted cheese execution, it’s hard to take away too many points for simple ingredients. Bun (20): Although it’s custom baked and noticeably fresh and fluffy, the bun was still a bit overbearing in size in comparison to the patty while also coming up short on complementary taste. In a city that endears itself to over-the-top cuisine, trendy ambiance and wildly popular man-about-town chefs, we as self-proclaimed foodies can always embrace a classic. Often, a divergence from the norm and a reversion to that classic American restaurant experience and fare is just what the doctor ordered. Enter Peter Luger Steakhouse – a Michelin Star winning, 24 years and running best steakhouse winner from Zagat, which not only offers a great porterhouse but an incredibly insane value of a burger. Given that most reviews we’ve written in order find the best burger in NYC have lead us to Manhattan vaunts, we relished the opportunity to venture across the East River to Williamsburg, Brooklyn in an effort to devour a burger that almost always makes its way onto the “best of” lists of esteemed food critiques around the country. From Frank Bruni of the New York Times to GQ’s Alan Richman, burger enthusiasts have showered Luger with praise and we were eager to test the ranks and hopped the L train to Brooklyn on a sweltering summer Saturday. Our Expectations: The Luger Burger. Over ½ a pound of freshly ground prime beef on a brioche bun – all for $8.95. Add cheese (which we did, American) for $1.50, and you’ve easily got one of the best values on the Luger menu. Notably, you have to head to Luger during lunch hours (until 3pm) to take a bite of their dish, so it’s easy to miss. Regardless, with a burger cooked in the same famous broilers as their steaks, a lunch-time trip to the steakhouse is an easy sell. Meat: Much like the undeniable taste and flavor of their steaks, Luger hit the bulls-eye with their patty’s meat. Setting the standard for what is sure to be a hard to beat ranking for burgers, the glorious flavors immediately engulf your taste buds to the point of a taste utopia. With a perfect combination of tender juiciness and seasoning, the meat is without a doubt the stand out of the burger composition. Attentiveness in the kitchen is apparent as well, as the three burgers ordered (all medium rare) came out with a pleasant result of pinkish red in the center and lightly charred and glazed on the outside. 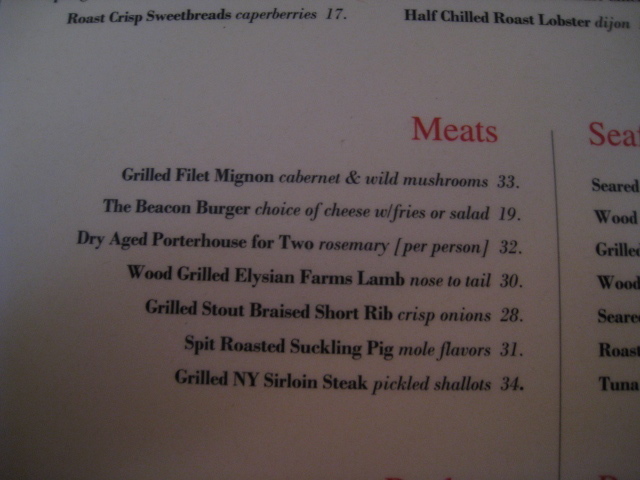 Toppings: Clearly, you don’t venture to Peter Luger to eat a burger and expect copious amounts of inventive toppings or fancy accoutrements. You go for the meat, period. Though the bacon is renowned (thick-cut and a must have, we ordered it on the side), in our opinion it doesn’t belong on the burger…it’s a meal in itself. 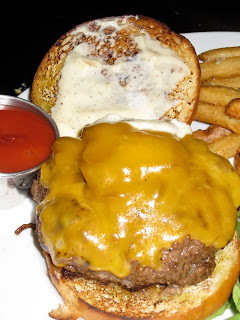 Still, we ordered American cheese, which was thoroughly draped over the patty, and topped our burger with the raw onions that came on the side. Each topping was enjoyable but not entirely necessary, so we did remove each halfway through eating, just to get the true Luger burger dining experience and enjoy the meat's flavor. Bun: With a sizable patty comes a sizable bun. Given 8 to 10 ounces of beef is provided, Luger does an admirable job of evenly slicing a nicely toasted brioche bun that comfortably holds the patty without a superfluous portion. Nutty and light, but still a bit standard and average, the bun fares well through every bite while encasing the burger juice to a T.
Meat (50): Superb, magnificent, brilliant…choose your adjective and insert here. Such sumptuous beef in the best burger in NYC search deserves a perfect ranking, and we obliged. Toppings (21): To be fair, we’ve noted that the meat is so striking, these aren’t necessary. That said, we enjoyed the American cheese and onions, but might skip them altogether on our next tasting since our bites without the toppings were remarkable. Bun (22): Impeccably sized and cut, a well received bun that stands its ground to a formidable patty. Dipping back into the Danny Meyer restaurant “well,” our latest burger tasting in the search for the best burger in NYC comes from his barbeque staple on 27th Street, Blue Smoke. Offering “regional barbeque styles from across the country” the dining spot caters to every type of carnivore out there. While Executive Chef Kenny Callaghan serves up delicious ribs, pulled pig and brisket along with a cornucopia of savory sides, we heard quite a bit of buzz about the burger. In addition to the tasty reviews we’d encountered, an almost-too-predictable influence to the allure of the burger was it's meat blend coming from who else but Pat LaFrieda. While we could easily wax poetic for days about our burger devouring history with LaFrieda's blends, we hoped to get past any positive biased opinions we may have formed and took on the Blue Smoke Burger with an open mind and empty stomach. Our Expectations: The Blue Smoke Burger. A nine-ounce patty of Pat LaFrieda beef from Creekstone Farms. Served with your choice of cheese (American for us) and house-cured bacon, which we gladly added. Any and every review we read had incorporated the two toppings in their eating adventures, so we always follow suit. Still, our readers should note, we always break down the meat on its own by taking a few bites with purely patty alone in order to assess the taste, with the Blue Smoke Burger no exception to the rule. Meat: Making a bold impression from the get go, the initial bite into the burger attacks your palate with a sweet saltiness. 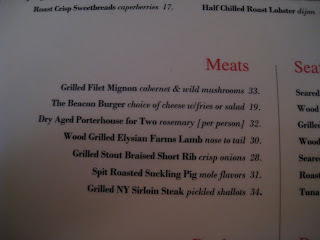 Yet, although the meat is plenty juicy, it lacks the fresh and tender composure of many other best burger in NYC contenders. The seasoning is comparable to some of the stronger candidates on our list, but as you navigate your way through each bite and into the middle of the patty, the seasoning falls off considerably. We like a thorough mixture of seasoning in the patty blend, so points were taken from the meat in that regard. Toppings: We expected a favorable outcome from the toppings and Blue Smoke delivered. The house cured bacon was quite tasty, providing a smoky goodness to each bite. Blending effortlessly with the simple saltiness of the patty, the bacon is a must try and adds a crispy texture. American cheese blanketed the burger with ease and was melted fully, a nice showing there. Bun: A conventional brioche bun, it served its purpose adequately and was toasted well. Brioche always contributes a slight nuttiness to every bite, while it continues to be a popular choice amongst chefs serving a larger sized patty. Yet, in our eyes, such a bun requirement is indicative that the patty doesn’t always need such magnitude. Additionally, as we ate, the bun fell apart somewhat. We can’t help but think that a more evenly distributed slice of the bun would lend a better hand in staying together throughout the meal. The bottom half was clearly too thin. Meat (44): Great taste, blended with a nice saltiness that isn’t too in your face, The juiciness is there but the tenderness is lacking. Seasoning drops off as you get through the patty and the vast size might be the contributing factor in that area. Toppings (22): Bacon that can hold its own to any of our burger reviews, the smokiness and crisp texture won us over. The cheese is always a plus and was presented adequately, but is not necessarily needed with this burger. Bun (20): Decent taste and toasted to our liking but sliced unevenly which caused for some messy eating. Not our favorite choice of bun, but necessary for the size of the patty. From the start of our search for the best burger in NYC, Minetta Tavern has been acclaimed, lauded, worshiped and whatever other adjective you care to fill in the blanks with, to us. People come from far and wide to try the notorious Black Label Burger, a collaboration between the blend of Pat LaFrieda Wholesalers (care of Creekstone Farms ) and preparation by Chefs Nasr and Hanson of Minetta. The unrelenting praise for the Black Label Burger from many distinguished publications and websites can be overwhelming at times. A negative review or account is extremely hard to come by, almost as eluding as a vaunted 8pm Saturday night reservation at the Tavern. Moreover, every detail of preparation, ingredient sourcing and cooking process has been noted in many eating instances - our friends at A Hamburger Today have the best breakdown here. As for us at Burger Bedlam, the anticipation of taking a bite of the Black Label Burger might be as high as any we can recollect. With a dinner reservation booked A MONTH in advance, we took a trip the MacDougal St. to enjoy what has become our most eagerly anticipated eating experience. Our Expectations: The Black Label Burger. Featuring an eight-ounce patty, caramelized onions and a custom sesame seed covered brioche style bun. As noted previously, the burger is famous for its secret blend by meat wholesaler Pat LaFrieda and with meat from the highly regarded Creekstone Farm in Arkansas City, Kansas. Recently, there were a couple of fantastic write-ups in both the New York Times and New York Magazine regarding Creekstone Farms and Pat LaFrieda, respectively. Those should emphasize what diligent and concentrated efforts go into making the Black Label Burger. 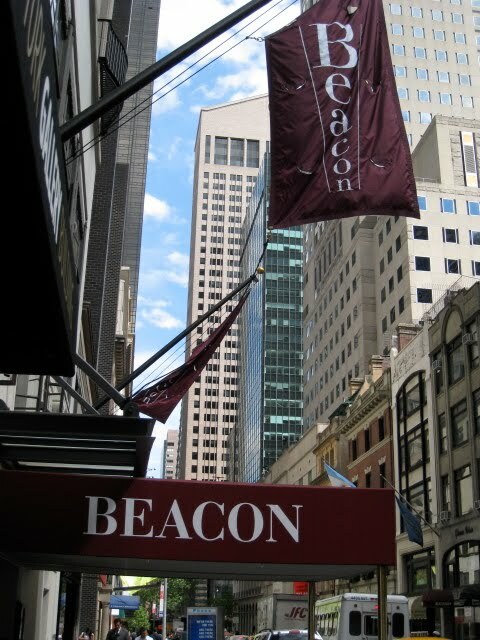 We’ve read countless reviews of the burger, with the majority of them claiming it’s the best burger in NYC. So, naturally, we hoped to add our two cents. Meat: Much can be argued, both positively and negatively, regarding the meat flavoring and seasoning of prior burger’s we’ve tried on our search for the best NYC burger. That topic is quite subjective. Yet, when it comes to the meat of the Black Label Burger, there should be no discussion, it’s near flawless. From the copious amount of dry-aged Ribeye (as well as Skirt and Brisket) packed within to the clarified butter drizzled throughout, the meat is as tasty as it sounds. Encompassed in a glazed crust, every bite is magnificent. Though, the butter magnitude is not for the faint of heart, it’s heavy and often too powerful. Regardless, the fact that you’re eating a heaping amount of muscular Ribeye that normally goes for $90 on the menu as an entrée, it can be characterized as a steal of a deal. The cooked temperature is perfect and the juiciness lasts to the last bite. It’s a freshly made patty that deserves all the praise thrown its way. Toppings: Sometimes they say less is more, but in this instance, less might need to be even less. As much as the meat deserves its due, the single topping of caramelized onions failed to impress. We’ve had plenty of crunchy, sweet onions but these were quite soggy. Tasty, sure, but much too soggy. Our guests for the review even mentioned how much they wished the burger came without onions so one could enjoy the overwhelming star that was the patty. We agree. Not to say that the onions were bad, because they were obviously meticulously prepared and generously draped on the burger, but they didn’t win us over. Bun: With a considerable size, the eight ounces of meat in the Black Label Burger require a bun that can withstand the entire eating experience. With that in mind, it was clear to us that potato rolls might not make an appearance with such an entrée. Thus, Minetta and their chefs decided on a custom sesame seed brioche bun with a fluffy interior and dark coloring. Notably, the bun did have that greasy, glazed feel on the bottom half as noted in A Hamburger Today’s article linked earlier. Though, we can’t help but imagine what the burger would have tasted like with a sweeter flavoring rather than the “nuttiness” of the brioche. It held up well as we ate, but added nothing to our taste buds. Meat (49): As near flawless as you can get but we deducted one point for the overwhelming taste of butter with every bite. Yes, there is more muscle than marbled fat in the patty and the flavoring needs a boost, but the butter could be lessened slightly. Toppings (19): An average showing from the caramelized onions, we wish they had more crunch and less moisture. Bun (20): A great bun to burger ratio and a solid texture. Yet, the bland nutty flavor was a bit disappointing.